Network Attached Storage (NAS) Market size was estimated at over USD 6 billion in 2017, growing at around 20% CAGR from 2018 to 2024. The NAS market is witnessing an accelerated growth and is projected to register robust growth over the forecast timeline due to the rapidly increasing applications of Big Data analytics & data mining, increasing popularity of NAS solutions in home/consumer applications, and the growing adoption of cloud-based network attached storage solutions. Businesses are increasingly storing large volumes of data onto these storage systems due to the enhanced benefits of scalability and ease-of-access. These solutions offer a scalable and a comprehensive data storage mechanism to collectively store and retrieve critical data associated with different systems operating within a network. The adoption of network attached storage solutions for home-based applications is increasing exponentially due to the large amount data being generated from various home entertainment systems. With a large volume of data being downloaded from on-demand entertainment systems and the increasing demand from consumers to store and share digital content between multimedia devices, such as tablets, smartphones, and laptops, the demand for NAS systems for home-based applications is likely to rapidly increase between 2018 and 2024. Also, NAS systems are increasingly utilized for storing and serving multimedia content for automated backups, centralized storage applications in smart homes for security systems, smart TVs, and other IoT components. Traditional (scale-up) architecture segment accounted for around 75% of the NAS market in 2017 due to the large-scale deployment of legacy storage systems in enterprises. However, scale-out NAS architecture is expected to register an accelerated growth with a CAGR of over 35% between 2018 and 2024. This growth can be attributed to the benefits of scale-out NAS architecture over traditional systems in terms of reduced hardware complexity and the flexibility of scaling performance and capacity on an as-needed basis. As the data in scale-out architecture is distributed across many storage controllers, the system’s clustered framework ensures an enhanced availability of storage resources. Another key advantage of scale-out NAS architecture is that it allows users to move and manage petabytes of data through a single distributed file-system along with the global namespace. This allows users to maintain multiple nodes across data centers in different geographic locations. Due to such enhanced flexibility and availability features, the scale-out NAS market is expected to register a high growth between 2018 and 2024. The 12-bay to 20-bay NAS segment held around 40% share of the overall network attached storage market in 2017 due to the large-scale adoption of medium configuration NAS solutions by SMEs and Small Office/Home Office (SOHO) customers. These systems are ideal for SMEs for performance-oriented storage that is reliable, fast, and secure. On the other hand, the 1-bay to 8-bay NAS market is expected to register the fastest growth over the forecast timeline. This accelerated growth can be attributed to the increasing adoption of basic NAS systems for home/consumer applications. Compared to USB storage devices for data storage and file sharing, NAS solutions offer consumers a more convenient alternative for sharing multimedia content such as photos, music, and videos. With a large storage capacity and excellent file transfer speed, these solutions prove to be critical resources for data backup and recovery for home-based applications. The on-premise deployment segment dominated the overall NAS market in 2017 due to large-scale deployment of legacy scale-up network storage systems for data storage backup functions. With the increasing popularity of cloud computing platforms for scalable data storage applications, the cloud deployment model market is likely to register a high growth with a CAGR of over 23% over the forecast period. Hybrid deployment market is projected to register the fastest growth between 2017 and 2024 as it offers the convenience of data residency for storing mission-critical data on-premise, facilitating the cloud-based storage of non-critical data in a scalable architecture. The consumer NAS market is projected to grow at around 25% CAGR during the forecast period due to the increasing popularity of NAS solutions for data sharing, backup, and recovery purposes among consumers. The system provides a scalable and affordable mechanism to backup multimedia content from personal devices such as smartphones, PCs, laptops, smart TVs, and home automation systems. As these devices can be used as multimedia hubs for storing, accessing, and sharing photos, documents, music, and video among family members, their adoption is likely to accelerate swiftly during the forecast timeline. BFSI applications were valued at around USD 1.5 billion in 2017, and is expected to maintain a major network attached storage market share by 2024. The majority share is attributed to the large-scale deployment of the storage technology by financial institutions to store huge volumes of financial data of their customers requiring a scalable and a robust storage infrastructure. IT & Telecom market is projected to register the fastest growth between 2017 and 2024 with the growing uptake of NAS systems for efficiently managing the increasing data storage requirements between a diverse set of nodes operating in distinct locations. 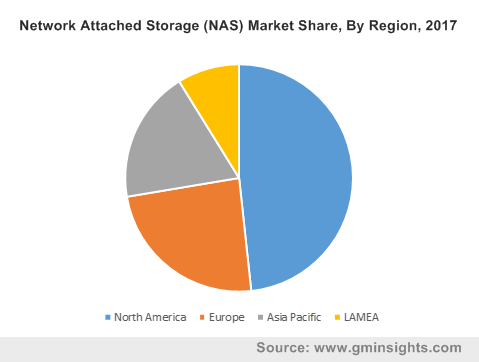 North America is projected to dominate the global network attached storage market throughout the forecast period due to the early adoption of advanced storage technologies by enterprises in the region coupled with rapidly growing digitalization across various end-use sectors. With a rapidly-growing e-commerce ecosystem in the area, especially in the U.S., the demand for NAS solutions in the region is likely to grow consistently at around 20% CAGR between 2018 and 2024. Asia Pacific network attached storage market is expected to register the fastest growth during the timeline due to the increasing awareness regarding the benefits of NAS solutions among SMEs, favorable government initiatives for digitalization of economy, and administrative framework along with the rapid emergence of technology startups, demanding affordable and scalable data storage solutions. Companies operating in the NAS market are focusing on designing and commercializing solutions aimed at different sections of the customer landscape with respect to the storage capability requirements and the desired level of integration capabilities. The companies are also emphasizing on geographical expansion to introduce their products in new untapped markets with a potential for favorable uptake of NAS solutions. Some of the key players operating in the network attached storage market are Western digital, QNAP, Netgear, Thecus, Synology, Buffalo Americas, Seagate, DELL EMC, Hitachi Data Systems Corporation, NetApp, Zyxel, Cisco, D-Link, Asustor, Infortrend, Avere Systems, SoftNas, Pansas, and Broadberry. The digital distribution of media is becoming increasingly important along with the additional requirement of making the media available to multiple users. Traditionally, servers have facilitated these functions in organizations by offering storage that can be accessed by multiple devices on a network typically through file serving or sharing or through a Storage Area Network (SAN). Network Attached Storage (NAS) systems are an extension of traditional servers that are built specifically for and are limited to file storage and sharing.